European Central Bank chief Mario Draghi today warned of risks weighing on growth in the euro zone, describing current economic indicators as "weak". "The risks surrounding the euro area growth outlook remain tilted to the downside, on account of the persistence of uncertainties related to geopolitical factors, the threat of protectionism and vulnerabilities in emerging markets," Mario Draghi said. 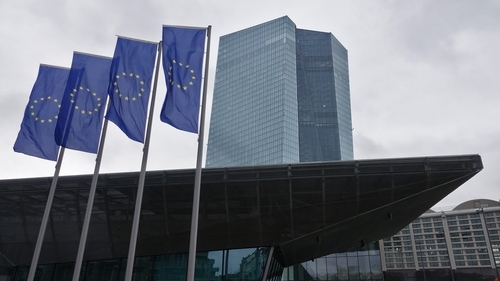 However, the ECB chief echoed the International Monetary Fund forecast for the euro zone by saying there is currently little risk of recession. "The estimated probability of recession remains low," Mr Draghi stated. His comments come after the European Central Bank kept its policy unchanged as expected today. The ECB maintained euro zone interest rates at record lows and kept its guidance for steady interest rates this year despite a sharp slowdown in economic growth. With the economy and inflation both slowing, the ECB has already backtracked on its plans to tighten policy this year. Instead it has unveiled instead even more stimulus to prop up an export-focused economy now struggling amid a global slowdown in trade. "The Governing Council now expects the key ECB interest rates to remain at their present levels at least through the end of 2019, and in any case for as long as necessary," the ECB said. Today's statement reaffirmed the ECB's interest rate guidance. While this policy is out of sync with market expectations, which put the first hike in 2021, policymakers have dismissed the significance of the disconnect. They argued that economic conditions would impact the eventual move and market prices simply reflect the changing outlook. With today's decision, the ECB's rate on bank overnight deposits, which is currently its primary interest rate tool, remains at -0.4%. The main refinancing rate, which determines the cost of credit in the economy, remained unchanged at 0% while the rate on the marginal lending facility - the emergency overnight borrowing rate for banks -- remains at 0.25%. At today's press conference in Frankfurt, Mario Draghi also said that Europe's banking sector is overcrowded and in significant need of consolidation. The sector needs to take a series of actions to improve its business model, he told a post-policy-meeting news conference. "That can be achieved however only through consolidation, and the need for consolidation is very, very significant," he said. "There is a relationship between scale and the capacity to undertake the investments that are needed to improve technology and be competitive, especially in certain business models," he said. Asked about the European Central Bank's supervisory role in mergers, he said the main priority was for transactions to be successful, meaning pleasing to shareholders and creating a strong business entity. He also said the bank had no preference between cross-border and national banking mergers. The ECB chief also said today that Brexit is a major uncertainty overhanging the euro zone economy, but he added that he was "still hopeful" that major disruptions such as breaks invalue chains could be averted. "I think the consequences of Brexit are different whether it is a hard disorderly Brexit or whether it is properly managed with an adequate transition period," Draghi said. "They are having votes every day (in the British parliament) so it would not be right to anticipate one thing or another," he said. "What is clear however - the whole discussion on Brexit, which has lasted now many years, really, is part and parcel of the overall uncertainty that is hanging over our continent and I think is hanging over the UK as well," he added. The ECB and the Bank of England have so-called "swap lines" in place to offer each other's currencies in banks in their respective jurisdictions if money markets freeze up. While the relatively large size of the euro zone economy should limit the impact of Britain's break away from the EU, Draghi noted that some members are heavily exposed to the British economy, which could have serious consequences for themand "reverberate around the rest of the continent". He also warned that a break in value chains between Britain and Europe would have "lots of local and possibly serious effects". "But again I am still hopeful," Draghi said.